Topic 3 demonstrates the need and strategic considerations for both adaptation and global-scale mitigation to manage risks from climate change. Building on these insights, Topic 4 presents near-term response options that could help achieve such strategic goals. Near-term adaptation and mitigation actions will differ across sectors and regions, reflecting development status, response capacities and near- and long-term aspirations with regard to both climate and non-climate outcomes. 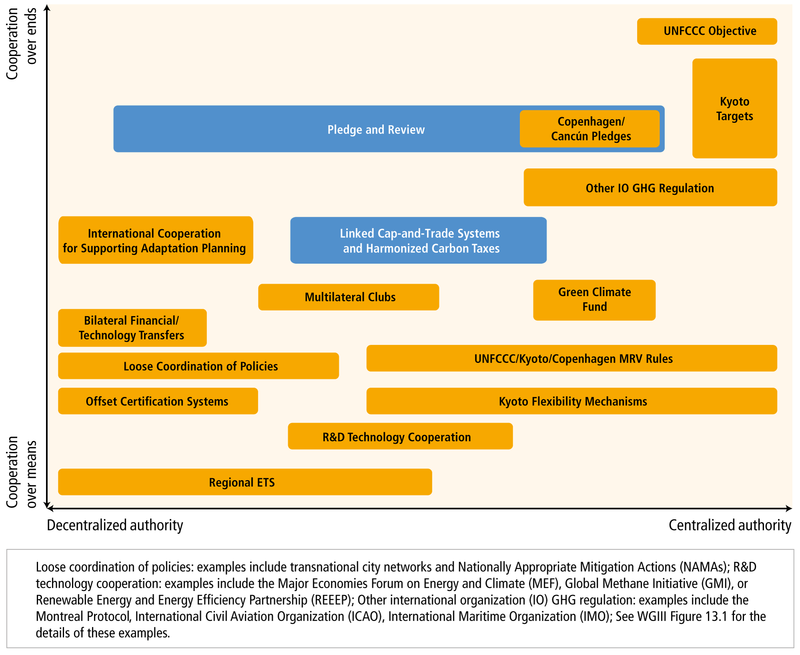 Because adaptation and mitigation inevitably take place in the context of multiple objectives, particular attention is given to the ability to develop and implement integrated approaches that can build on co-benefits and manage trade-offs. Adaptation and mitigation responses are underpinned by common enabling factors. These include effective institutions and governance, innovation and investments in environmentally sound technologies and infrastructure, sustainable livelihoods and behavioural and lifestyle choices. Mitigation options are available in every major sector. Mitigation can be more cost-effective if using an integrated approach that combines measures to reduce energy use and the greenhouse gas intensity of end-use sectors, decarbonize energy supply, reduce net emissions and enhance carbon sinks in land-based sectors. For possible upstream effects of biomass supply for bioenergy, see AFOLU. 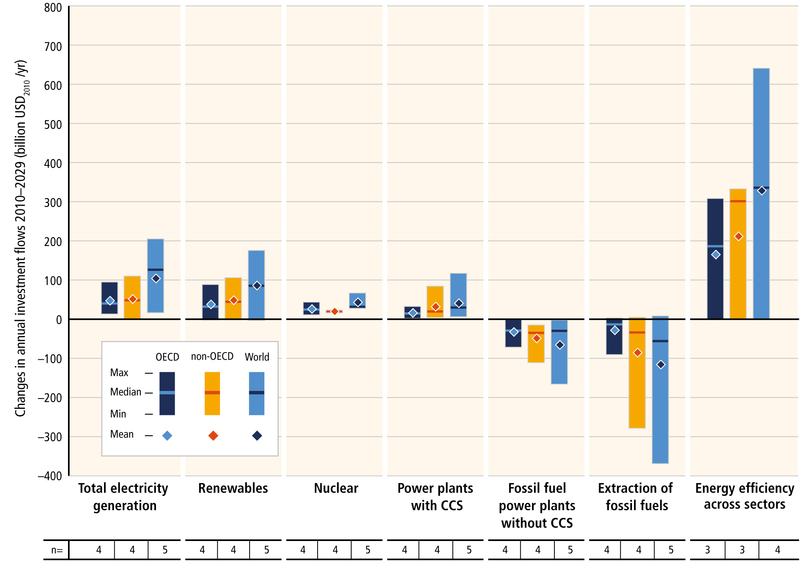 For possible upstream effects of low-carbon electricity, see Energy Supply. For biomass supply, see AFOLU. For possible upstream effects of fuel switching and RES, see Energy Supply. 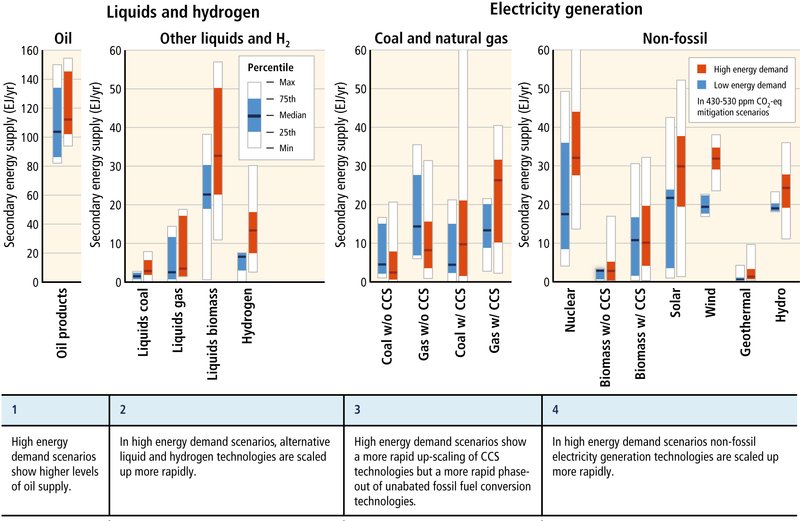 For possible upstream effects of low-carbon energy supply (incl. CCS), see Energy Supply and of biomass supply, see AFOLU. Note: co-benefits and adverse side-effects depend on the development context and the scale of the intervention (size). For compact urban form and improved transport infrastructure, see also Transport. Adaptation policy has been developed across all levels of government, with some adaptation planning integrated into coastal and water management, into environmental protection and land planning, and into disaster risk management. Adaptation is being facilitated in some areas through mainstreaming climate adaptation action into subnational development planning, early warning systems, integrated water resources management, agroforestry, and coastal reforestation of mangroves. Planning for sea-level rise, and in southern Australia for reduced water availability, is becoming adopted widely. Planning for sea-level rise has evolved considerably over the past two decades and shows a diversity of approaches, although its implementation remains piecemeal. Governments are engaging in incremental adaptation assessment and planning, particularly at the municipal level. Some proactive adaptation is occurring to protect longer-term investments in energy and public infrastructure. Ecosystem-based adaptation including protected areas, conservation agreements, and community management of natural areas is occurring. Resilient crop varieties, climate forecasts, and integrated water resources management are being adopted within the agricultural sector in some areas. Some communities have begun to deploy adaptive co-management strategies and communications infrastructure, combining traditional and scientific knowledge. Small islands have diverse physical and human attributes; community-based adaptation has been shown to generate larger benefits when delivered in conjunction with other development activities. International cooperation and marine spatial planning are starting to facilitate adaptation to climate change, with constraints from challenges of spatial scale and governance issues. 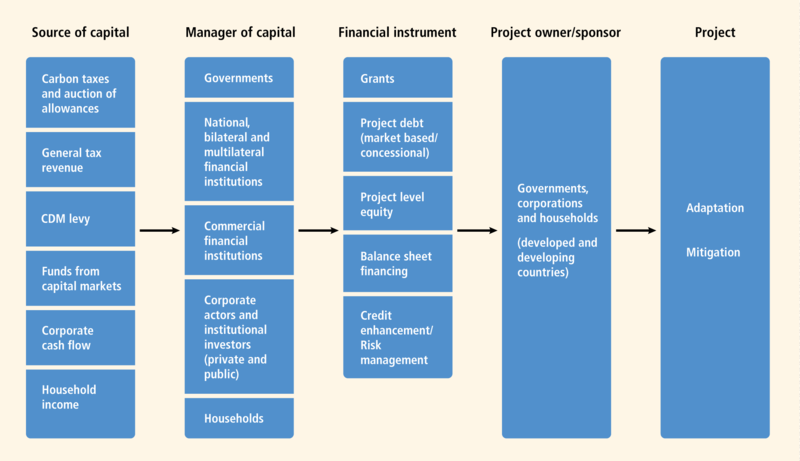 Credit lines for low-carbon agriculture, sustainable forestry. Provision of utility infrastructure, such as electricity distribution, district heating/cooling and wastewater connections, etc. There are many opportunities to link mitigation, adaptation and the pursuit of other societal objectives through integrated responses (high confidence). Successful implementation relies on relevant tools, suitable governance structures and enhanced capacity to respond (medium confidence). A growing evidence base indicates close links between adaptation and mitigation, their co-benefits and adverse side effects, and recognizes sustainable development as the overarching context for climate policy (see Sections 3.5, 4.1, 4.2 and 4.3). Developing tools to address these linkages is critical to the success of climate policy in the context of sustainable development (see also Sections 4.4 and 3.5). This section presents examples of integrated responses in specific policy arenas, as well as some of the factors that promote or impede policies aimed at multiple objectives.